In browsing the Studio forums, an issue comes up regularly: "I have no sound in Studio". It is true that it is a classic scenario using Studio. This problem usually happens after a severe Studio crash. But you should be aware that Studio is not the only link in the sound chain. So I suggest a more general method which consists in troubleshooting the different elements involved in the creation of sounds on your computer. The first step is to verify that the sound is audible when playing an audio file using software other than Studio (Windows Media Player, browser, game ...). If you have audio in Windows, using software other than Studio, you can skip to Step 7. From the Control Panel, open the Device Manager. Make sure there is no black exclamation mark in a yellow circle at the level of audio controllers. If there is a yellow circle with black exclamation mark, you may have a problem with missing or outdated drivers. Open the audio devices manager (Sound panel). Select the default playback device. Open the properties of the selected playback devices. Check that the device is enabled. Open the properties of the default playback device. Make sure the device is working properly. To eliminate the sound card and its driver as the issue, you can do the verification test as shown in the video at the right. But you should be aware that hearing the audio from the speakers in this test only means that your audio card outputs are operating normally. If a speaker is not connected or if its volume control is at zero, you will have control of the sound card output but not in the speaker. If you do not have a separate audio system connected to your computer, you can skip to Step 5 . Otherwise, if you have recently changed your connections (or if you did not do the hook-ups in the back of your computer yourself...), take the installation manual for the audio system and check the physical connections to your audio devices: front speakers, sub woofer, center channel, surround channels, side channels (if present). Finally, check the connection of your audio system to the sound card on your computer. 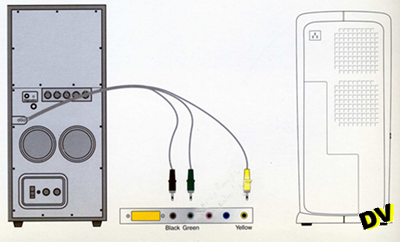 If all connections have been made between the computer, audio system and all your audio devices, be sure to check the position of the different switches and different physical potentiometers (rotary or linear) located on your audio devices or audio system set. Remember to check your keyboard if equipped with audio buttons. Click the "Sound" section in the control panel. Make sure the device is not muted. Adjust the volume control slider. If you're intimidated by all these manipulations, you can download and use the free "Microsoft Fix it" tool and in particular the "AudioPlayback" tool which we are concerned with now. Have the Microsoft Fix It tool perform all the operations. Or to assist you by simply informing you of the checks and operations it will perform in order to maintain the new setup for your computer. You are informed of the result. You can continue the configuration by clicking the "Next" button. You can display a detailed report. The detailed report will inform you of the checks, and changes that may need to be done. Open the Volume Mixer, either from the notification area or the Control Panel, to check the master volume level of each of the open applications. In our particular situation, open Studio and check that the Studio volume mixer is not muted and its sound level is at a suitable value. The video screen grab to the right shows how to do the check. After all these general checks, we will next focus our attention on the Studio interface. Enable/disable the audio mixer control on all tracks or a specific track. If you do not have sound on a particular clip, open the effects editor. Check for the waveform in the preview window. Check the audio level adjustment clip in the channel mixer (0dB being the middle position, but you can click on the "Automatically optimize of the volume of the clip" icon to fine-tune the sound level of the clip). Changing the stereo in the routing channel and adjusting the audio level of the clip are shown on 2 color VU Meters. It plays all right but just not rendering the waveform properly. To follow up on this, I tried deleting and re-adding the clip to the timeline with the same result. Renaming it and adding back to the timeline has solved it. It appears that this is a bug. Sorry. I already had this kind of problem: waveform not present. I never knew what to do... Seems that you found the solution and share it. There is also someone else who found another trick, posted on this website (google search for waveform): right mouse click on the clip and select Detach Audio. If the waveform is displayed, play it. I've got partial sound on an project imported from Studio 15 to Studio 18. Sound clips imported from my intro clip play OK but, all my voice overs .wav clips will not play. They appear on SountTrack with proper wave forms and will sound if I open the Audio editor and click Corrections. But when I close and save the editor it will not sound. There is a part of the clip that will sound (colored yellow) and the other part will not (colored orange). I don't understand why only the yellow part will sound and the orange part will not. Thank you so much for step #7. I didn't think to check that! The crash that occurred somehow muted the master volume for the Studio 19.5.